Fabric Mart Fabricistas: Made By A Fabricista - Sewing a Fall Packable Wardrobe with Fabric Mart Woolens! 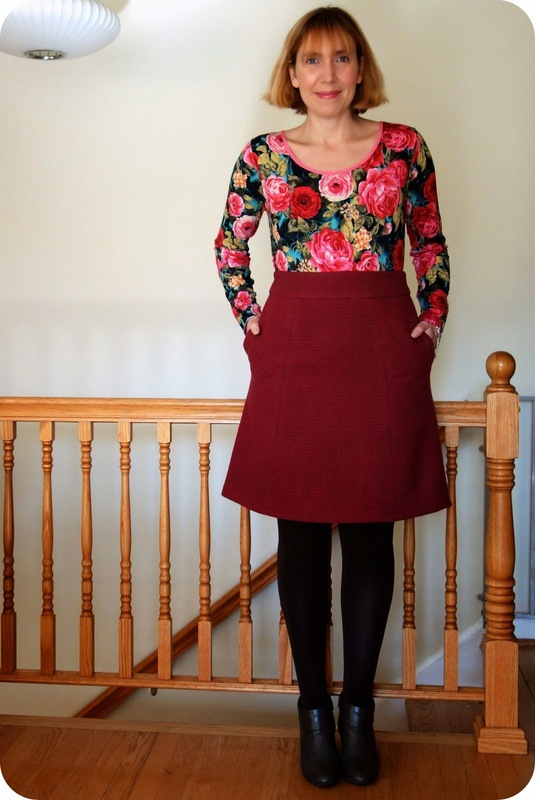 Made By A Fabricista - Sewing a Fall Packable Wardrobe with Fabric Mart Woolens! 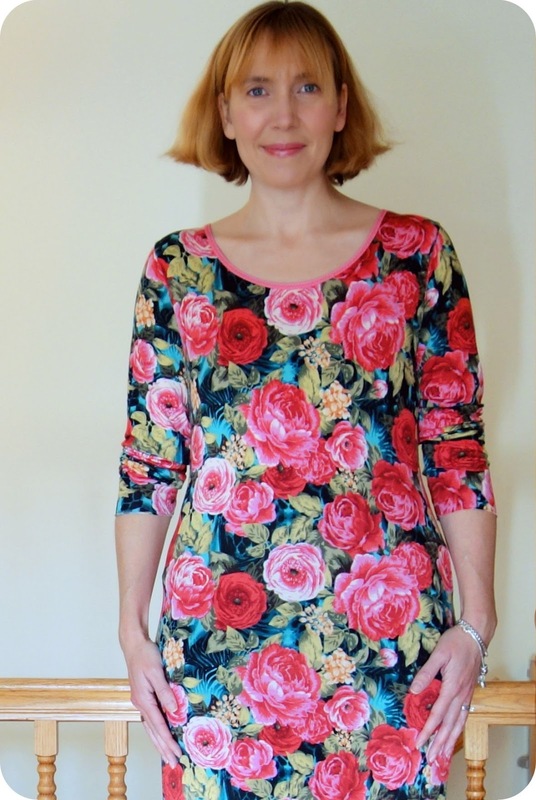 Next up on our new Fabricista blogger circuit is the winner of this year's Fabricista Sewing Challange Dina from My Superfluities! She and all of our participants this year did an amazing job and we are happy to have her join our team. ~Every year, without fail, I go with my family to my husband's childhood home in Mississippi, for an extended visit. Since we only get to the deep South once a year, my husband always schedules us to be there for around ten days. Problem is we only bring two suitcases (admittedly the large ones--but we do have three kids, too! ), and that means we don't have the luxury of packing ten outfits to last us the trip. Instead we do what every good packer does--we bring a few garments and a couple pair of shoes and a few accessories that we can mix and match so we can create ten looks from fewer overall pieces. I like to pick a few colors to use as a base for my packed wardrobe, and this year when I was asked to write my first post for the Fabric Mart blog, and was asked to choose a project and some fabric, I knew that I had to do a garment perfect for fall (a sweater jacket based on a cardigan pattern) that would also serve as the base color for my mix and match packed clothing. 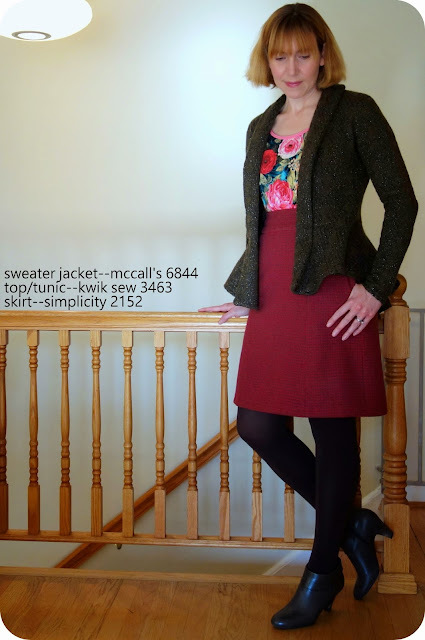 And because I am me, I couldn't just stop at one project from one fabric, I decided to buy a piece of Shetland wool from Fabric Mart, too, for a skirt, and use some stash fabric for a tunic/top that would mesh well with the skirt and sweater jacket. I have made all three pieces, and I am so excited to share the results of the labor of love. The main item is the sweater jacket which is based on McCall's 6844, aka the most popular pattern of 2013, a beautiful cardigan that can be made with an asymmetrical peplum hem, a regular peplum hem, or with a plain hem in two lengths. I chose the most popular of these four, the asymmetrical peplum hem, since I wanted to have a piece that could be dressed up but wouldn't look ridiculous with jeans, either. 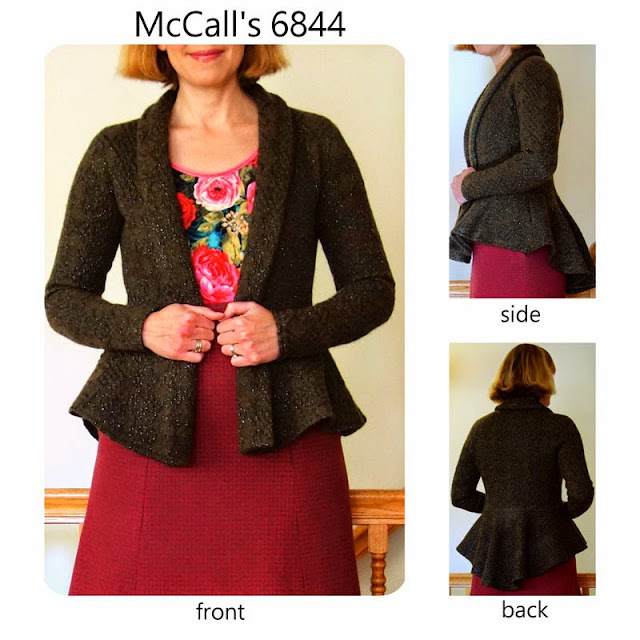 Since what I chose is very thick and heavy, and acts a lot like a felted wool, what I ended up with was less of a flowy cardigan and more of a structured jacket. 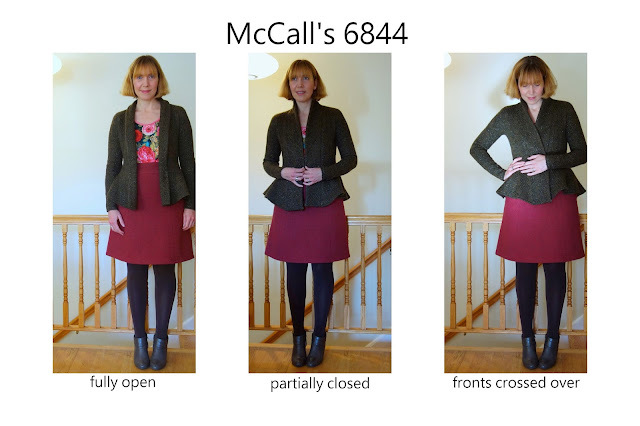 That said, because the sweater knit has a touch of stretch throughout (passed the knits test on the back of the pattern, but *just*), it does have more ease than a traditional wool jacket. I even was able to sew the sleeves in flat, which I didn't expect to be able to do (woo!). There is a few things of note when working with a heavy sweater knit like this one. 1. It sews up beautifully. I did use a jersey needle, which I am not sure I needed, but just to be safe I decided to go with it. Even though I thought the sewing would be tough, the fabric responded well to the stitching and there were no skips, etc. 2. It presses very easily. I was surprised at how well it presesed, I knew that I would have to press the jacket seams, especially the ones at the arms, and all it took was a lot of steam on the wool setting, along with my tailor's ham. I do plan on only dry cleaning it from here on out, though, don't want to mess with all that hard work I put into its construction. 3. It can be itchy. I have no problem with wools, but my stepmother tried it on and couldn't have the wool knit next to her skin. If you plan on wearing a jacket like this with longer sleeves, no big deal, but if you are planning on having it against bare skin and are sensitive, a lining may be needed. 4. The seams in some parts were VERY thick, especially at the shawl collar join to the main body of the jacket. There were three pieces of wool seamed together there, and I had to fully reduce two of the seams in order to properly stitch the collar back to the body on the inside. I did topstitch that part of the collar to the body, and the topstitching was a nice detail, and one that looks pretty cool in person, so again, worth the effort. 5. I decided to serge almost all of the seams even though I technically didn't have to...again done so I can be sure that the fabric won't unravel. I didn't serge the hem bit, though, since the longer back peplum's wrong side does show sometimes. 6. The collar does not easily stay open. To fix this, two snaps (black-colored to not show when not in use) are used to keep the shawl bit tacked back when that look is desired. I do really like the collar when it just lays there, though, especially when the back collar is popped up. It looks quite regal like that. You can also cross the fronts over each other, and because of the weight of the fabric, if it stays closed, would be a fine wind blocker. I do need to add a belt to ensure that it stays closed, but you could just as easily add snaps for the same effect (much like the snaps were added to keep the shawl tacked back). Since I have not made this pattern with a lighter weight fabric, I can't say if the collar issue is specific to this fabrics weight and heft. 8. Even though you *could* serge the entire jacket, I chose to not sew up the actual seams on the serger, and instead do so on my sewing machine with the walking foot. 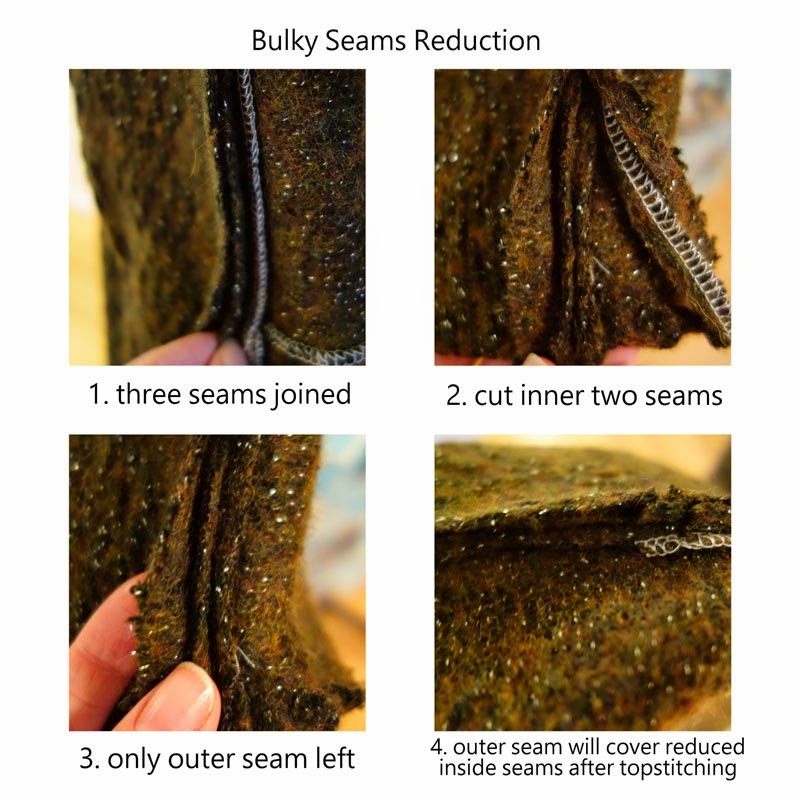 I really felt like I wanted very precise seaming, and even though I feel more proficient on the serger, the sewing machine allowed me more control over the end result. I wasn't sure if Simplicity 2152 would fit on the 3/4 yard remnant I received, but it did! I definitely want to tell you more about this piece, since I put some really cool finishes on the inside, and the manipulation of the fabric and the pattern pieces on that teeny bit of fabric was a bit of a wonder, so please do keep an eye out for my next blog post for Fabric Mart, where I will dissect the construction of this skirt from start to finish. I love having items like tunics in my arsenal when packing for vacation because they serve a dual purpose. The can be tucked into skirts (like I have done here) but they also can be worn with leggings for a much more casual look. I decided to give Kwik Sew 3463 a go with this stash floral fabric of mine, along with pink foldover elastic, and I quite like how it turned out, and it looks just as lovely tucked in the skirt as it does on its own. AND--here's my personal bonus and success, I made the entire thing, from cutting to finishing, in just TWO hours. I never ever have done that before. 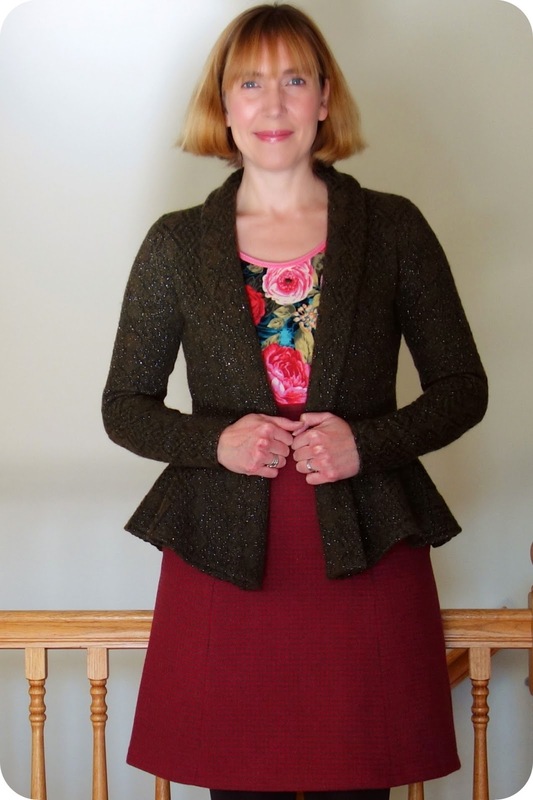 But after spending so much of my last week on the serger serging up the seams of the jacket and the skirt, I decided I now have enough control over it to properly seam up knits on the serger, and I did, and after making it in so little time, I had to pinch myself that I did it! Yay! What makes me laugh a little bit is that I fully made an exact copy of a dress I owned in 1993. LOL. I keep looking at it thinking if I just searched my dad's attic enough, I would find it hidden away. I think I will take this one, though, since it is so soft and made for my decidedly non-teenager shaped body. 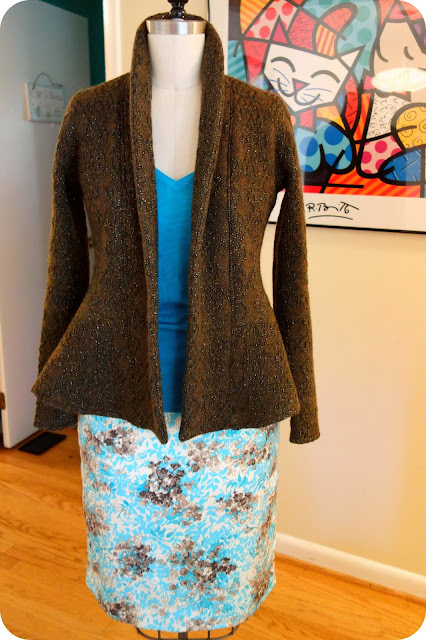 The Combo:Even though all three pieces have patterns to them, a jacquard knit with silver threading in the jacket, a houndstooth in the skirt, and a very bright floral in the top, they work together because they all share the olive/brown color in common. The skirt's pattern and the jacket's pattern can also read as a solid from far away, so that in reality, only the floral seems striking from far away. I am still trying to see what top to match with the skirt and jacket, but I think I have a contender, and yep, it's in the packed pile! Eventually I will publish all the outfits I created using my base colors, and when I do that, I will make sure to email Fabric Mart and ask them to post the link in here so you can see them. It is likely to be done in December, so make sure to pop back then! Thanks for reading, and I am super excited that I was able to write up this post for Fabric Mart! Dina, what an amazing mini wardrobe! It is so elegant yet fun at the same time. Stellar pieces! Cute outfits! I love 6844 (made it 5 or 6 times already!) and the idea of making it in a heavy fabric is a great one. Love this so much!!! 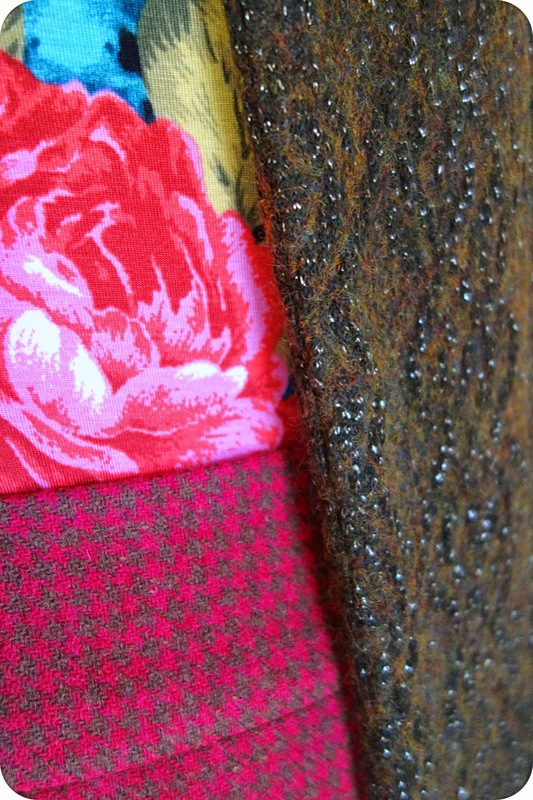 Beautiful combination of fabrics, Dina! It's really rich in colors and textures. I especially like how you finished the tunic with the pink elastic- it adds a playful note to the whole outfit. Have a wonderful trip! These are all beautiful pieces. You know, I think I have the aqua print in my stash too -- possibly from one of the FM bundles. Love all the pieces! I am about to go buy that sweater knit now! I love that! Looks great! I can see why that jacket is so popular- its adorable. Sarah C--I really want to see what you make from that knit! Please drop a link here of a photo of it if you can!! !